HomeDeath NoticesObituariesObituary: Alan Harold Joens Sr.
Joens Sr., Alan Harold Age 52 of Park Forest, Illinois, passed away peacefully March 29, 2014. Beloved husband of seventeen years to Mary Kay Joens (nee Graefnitz); loving father of Alan Harold Joens, Jr. "A.J. "; dear brother of Vernon Joens, Jr. and Cindy (Richard) Wendel; cherished uncle of Addy Wendel; dear son-in-law of William (Marlene) Graefnitz. Alan was preceded in death by his parents, Vernon and Barbara Joens. Visitation Tuesday, April 1, 2014 from 2:00-8:00 p.m. at Smits Funeral Homes-Steger Memorial Chapel 3045 Chicago Road Steger, IL 60475. Funeral Wednesday 10:00 a.m. at Trinity Lutheran Church 1393 Elizabeth St., Crete, Illinois. Interment Trinity Lutheran Cemetery – Crete, IL. 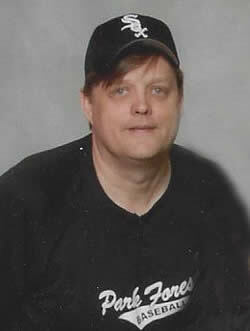 Alan was on the Board and a Field Director of PONY Baseball and Chairman of the Park Forest Baseball League. He was also an avid bowler.